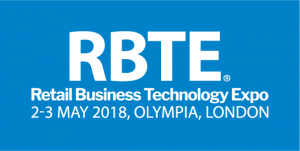 Visit Tellermate at RBTE, London 2nd-3rd May. Join Tellermate at RBTE in London for the UK launch of the Tellermate Touch. We’ll be giving exclusive demos of the first touchscreen cash counter with a dedicated web application. Drop by booth B128 to see how the intuitive Tellermate Touch feeds count data into the cloud-based application to give a denominational break down of till reconciliations, safe counts and even banking preparation. It’s the perfect solution for Area Managers, or Loss Prevention execs, enabling you to keep track of the cash across all your stores, reduce shrink and increase accountability – even when you’re on the move. Plus, we’ll also be showcasing LiveDrawer® – the intelligent cash drawer and software solution which enables you to virtually eliminate cash loss at the POS. LiveDrawer’s built-in count-by-weight technology means that your cash is automatically reconciled against the POS – firing instant alerts if a cashier short-changes a customer or steals from the till. While LiveDrawer Manager’s real-time dashboard and analytical reporting helps finance and operations teams to identify problem stores, suspect transactions and cashiers with higher than average rates of loss. Schedule a demo here or drop by booth B128 (opposite the Chill & Re-charge lounge) at the show.